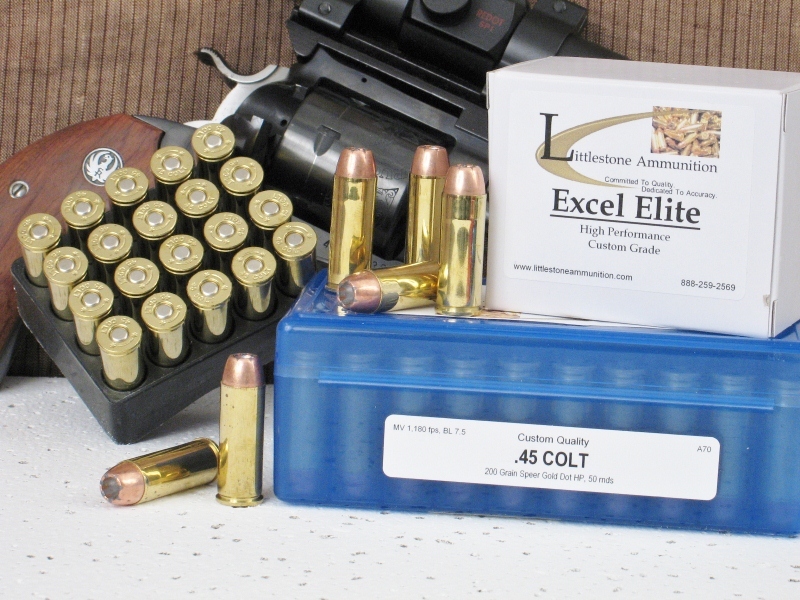 Twenty- and 50-round boxes of Littlestone Ammunition's loading of the .45 Colt cartridge with 200-grain Speer Gold Dot Bonded-Jacket Hollow Point bullets. Hover cursor or click on photo for close-up view. Firearm not included. Carrying a .45 Colt? Boost your firepower -- and your family's safety -- by chambering Littlestone Ammunition?s Custom-Quality loading of Speer's famous Gold Dot bullet. This 50-round box features 200-grain bullets with a muzzle velocity of 1,150 fps and 587 ft pounds of energy. Feature 3: MV / Energy / Barrel: 1,150 fps / 587 ft lbs / 7.5"